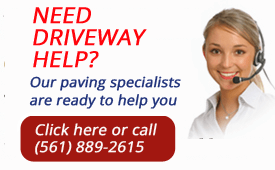 We offer a wide variety of services for driveways. From new installations to driveway repairs and maintenance , from Davie to Delray Beach to West Palm Beach. we do it all. All material furnished meets Florida state specifications. If a new driveway is what you want we can help you achieve your goals. We start by removing any excess dirt or grass you may have by digging out the existing terrain to a depth of 6″. Our next step is to ensure you have a solid foundation by installing a DOT certified road base. Then we compact the road base to reach 98% density with a four ton roller. The next step is to apply an asphalt prime to the rock to ensure proper adhesion. After that we will install 1.5″ of SIII Hot Asphalt and compact it with a four ton roller. 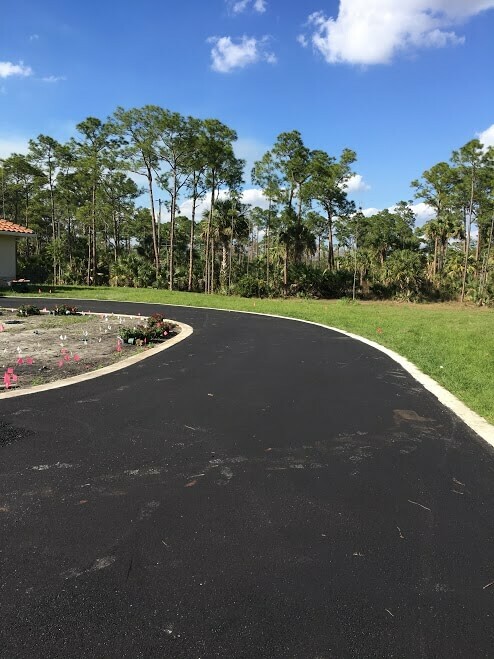 From West Palm Beach to Delray Beach to Davie, Florida, Call us for a free quote on your new driveway or repair today at (561) 889-2615. 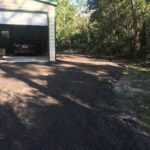 We start by removing any loose particles and debris from your existing asphalt driveway ,by way of motorized blowers and manual brooming, treating any vegetation growth with a highly concentrated herbicide. Our next step is to sawcut and remove any tie-ins or high spots you may have (this sawcutting and asphalt removal will happen any place where asphalt meets concrete or paver bricks). At this point we will prefill any low lying areas to bring them to proper elevation. The next step is to ensure proper adhesion and eliminate mirror effect (when cracks reappear at a later date) by applying a SSIH tack oil bonding adhesive. 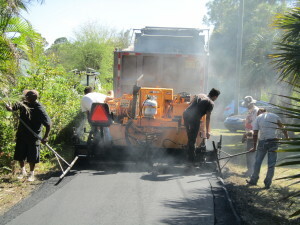 After that we will install 1.5″ of SIII Hot Asphalt and compact it with a heavy duty motorized roller. 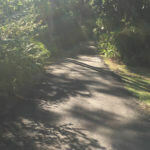 Millings driveways are very popular with eco-friendly and equestrian clients such as those in the Wellington area. We use a double crushed (popcorn) millings in our installations, which is an ultra fine form of millings. First we start by marking out where you would like your driveway, than we excavate what we need to reach proper elevations . Once we have the subgrade set we install the millings to the driveway approximately 4” thick. The popcorn millings are then fine graded and than we wet and compact using a 3-4 ton roller. This is an economic, ecofriendly, alternative to paving. The crushed millings is softer on horses hooves and allows more comfort and care for your precious animals. Some customers request sealer be applied to their asphalt millings. This technique helps harden the millings and is preferential. When you want a concrete driveway, the first step is to dig out the existing terrain. We will then form and pour your driveway with a minimum of 3000 PSI concrete with added fibermesh (2500 is standard) for reinforcement. The concrete will then get a trowel or broom finish depending on customers preference. 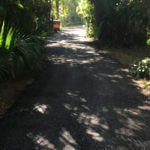 We also offer asphalt maintenance for your Florida driveway. Typical asphalt maintenance should consist of an annual seal coating to your asphalt driveway. This yearly service will add years to the life of your asphalt driveway. We use StarSeal Supreme coal tar emulsion with an additional 2% Macro+ Additive (Macro+ Additive improves durability and longevity while enhancing color). We start our seal coating process by removing any loose particles and debris from your existing asphalt driveway, by way of motorized blowers and manual scrubbing. Than we treat any heavily saturated oil spots prior to coating We then apply, one to two coats of our StarSeal Supreme sealer. There are two different application methods that include brush or spray application. Our expert can help you decide what application best suites your needs. When we find a driveway with cracks less than 1/4″ we like to offer Black Beauty aggregate. This wonderful product helps close in minor cracks and helps extend the life of your asphalt driveway, saving you thousands of dollars from future repairs. Black beauty is mixed with the asphalt sealer and than a thick slurry coat is than mopped on to pavement . When a driveway has cracks greater than 1/4″ we recommend Hot Crack Filler. Hot Crack Filling utilizes a rubber additive that is heated to 500 degrees to fill in cracks and bond loose surfaces together to help extend the life of your driveway. This service is to be used in conjunction with seal coating to ensure proper maintenance. This service will add years to the life of your driveway as well as save you thousands of dollars for future repairs. Sometimes the cracks are too large however and an asphalt overly is recommended. If you have a pothole or damaged asphalt area with raveling or deteriorated aggregate patching is recommended. 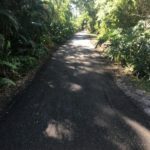 We will sawcut and remove the damaged asphalt as needed.Then we will install SIII Hot Asphalt to the area to be patched and compact the fresh asphalt.